With so many things to do in LA with kids you could easily spend a few weeks here and still not tick off all the LA tourist attractions. Whilst there are plenty of fun activities to do in Los Angeles centered around the glitz and glamour of Hollywood and movie stars, there are also plenty of other Los Angeles attractions such as art galleries, museums as well great hiking trails and lovely beaches. 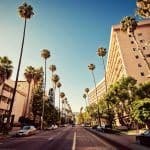 If you have a family trip to Los Angeles coming up, you will love this kid friendly Los Angeles guide. 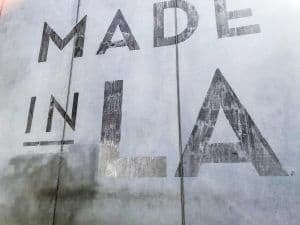 This guide covers all the things to do in Los Angeles with kids, including plenty of free things to do LA, as well as things to do near Los Angeles (including Disneyland!). 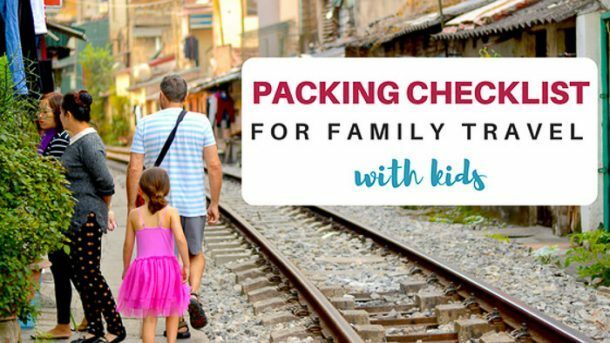 Other tips include where to stay with family in LA, how to get from the airport to Hollywood and how to get around to the various LA attractions. No matter the age of your kids, whether you are looking for things to do with toddlers in Los Angeles or things to do in Los Angeles with teenager, you will find plenty of LA attractions to ensure your family has a fantastic trip! Heading to NYC too? 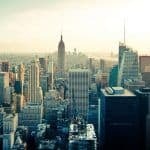 Click here to read my full guide on visiting NYC with kids. 9 You have Successfully Subscribed! Throughout this section I have provided a comprehensive guide to all the best things to do in LA with kids. I tried to provide as much information as possible to make your planning easier, including locations, opening hours and ticket prices. You will note that for many of the Los Angeles tourist attractions I often recommend you purchase your tickets in advance from Klook. Yes, I will receive a small commission if you do purchase from Klook – but as you will see in most cases you will save yourself a stack of cash if you book through them. I use them myself to book tickets – sometimes I have been known to sit outside the ticket booth of an attraction and book tickets on my phone from Klook as they are sooooo much cheaper. What to do in Los Angeles with kids? Let them find their favourite movie star’s plaque on the Hollywood Wall of Fame. Possibly one of the most popular Los Angeles tourist spots, this famous stretch of Hollywood Boulevard comprises more than 2,600 brass stars embedded in the sidewalks. These stars contain a mixture of famous people’s names which mark their achievement to the entertainment industry. 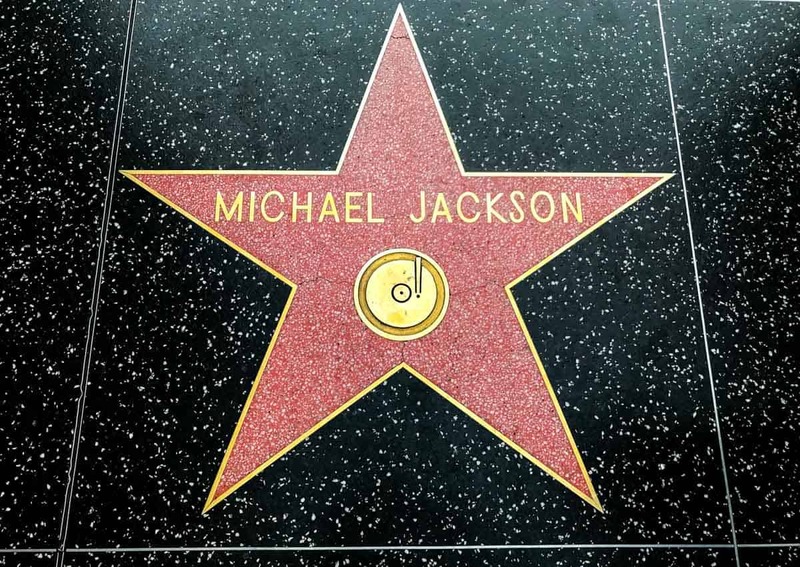 What many people don’t know is that this ‘Walk of Fame’ is quite a walk- over 15 blocks of Hollywood Boulevard and three blocks of Vine Street in Hollywood to be precise. However I found most of the “bigger” stars around the area where all the main Hollywood Tourist Attractions are. To find out a particular celebrity’s star check out the star search on the official website, this will save you heaps of time. This 30 minute tour will take you through one of the world’s biggest entertainment venues. See this huge 3,400-seat theatre in all its glory as you walk through listening to interesting and entertaining facts and stories from your engaging tour guides. The guided tours are from 10.30 am- 4 pm, on show days no tours are scheduled. Adult tickets are $25 USD, child tickets are $19 USD and under 3’s are free. Family tickets for 2A and 2C are $80. For discounted tickets I recommend you buy online from Klook to save! At the time of publishing, adult tickets were only $22 US and Children tickets were only $17 USD. Every saving Counts! Click here to buy discounted tickets online. The Dolby Theatre is adjacent to the world-famous TCL Chinese Theatre. Wondering what type of stroller to take to LA? Click here for my guide to lightweight travel strollers. 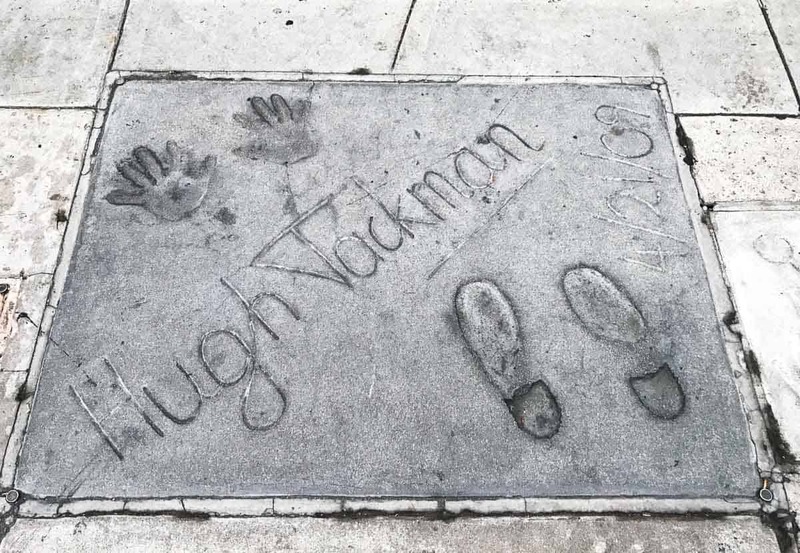 One of the top things to do in LA is to visit the famed forecourt of the TCL Chinese Theatre where you can see the hand and foot prints of legendary actors! To learn more about the theatre you can join a guided tour. On this tour you will learn the history of this cinema palace from inside and out and discover stories and amazing facts past and present. Ticket prices for the tour are $18 USD for adults and child tickets are $8 USD with free admission to children under 8. For discounted tickets I recommend you buy online from Klook as you can save heaps! At the time of publishing, adult tickets were only $13 US and Children tickets were only $7 US. That’s a $5 saving on adult tickets! Click here to buy discounted tickets online. The theatre is located on the Hollywood Walk of Fame. Heading to San Francisco? Click here for 63 things to do with the kids in San Fran! This museum is home to a collection of memorabilia from the history of American motion pictures and television. The most extensive collection of authentic Hollywood memorabilia in the world is on display here over four floors of magnificent exhibits. With more than 10,000 authentic treasures from favourite movies and TV shows, the whole family will be entertained. Adult tickets are $15 US and child tickets are $5 US, children 5 and under are free. The museum is open Wednesdays to Sundays 10 am -5 pm and is located at 1660 N. Highland Ave. on Hollywood boulevard. It is housed in the historic Max Factor Building on Highland Ave.
What to do in LA with kids? See the Hollywood sign of course! A trip to LA would not be the same without a photo with the famed Hollywood Sign. Though it is visible from all over the city from its high up position on Mt. Lee, it can be hard to get a good angled and un-obstructed shot. Below I have listed the best vantage points to take your perfect selfie with these iconic 45 feet tall letters. From the Hollywood and Highland Shopping Mall: From the corner of Hollywood Boulevard, walk north on to Highland Avenue and take the first left hand turn. This is the entrance to driveway of the shopping centre car park – labelled “Johnny Grant Way” Turn left into Johnny Grant and then an immediate left up the stairs to the patio level above. From the Griffith Observatory: This is by far the easiest highest vantage points to take a photo of the Hollywood sign. There is plenty of other top LA attractions here too – see below for more details. From Mulholland Drive: the ‘Hollywood Bowl Overlook’- this place offers a wonderful view of the Hollywood Sign complete with a historical placard. Whilst hiking: there are various hikes around and behind the sign on Mount Lee, if you don’t do easy. 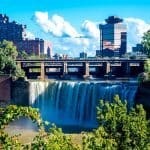 Check out this website for different trails for all different level hikers. Certainly one of the interesting things for kids to do in Los Angeles is take a visit to the Guinness World Records Museum. The kids will love attempting records of their own and comparing themselves against the words tallest man or perhaps their weight against the worlds heaviest person. Adult tickets are $20.99 US and child (4-11) tickets are $10.99 US, children under 4 are free. For varied opening hours see the website. This Museum is at 6764 Hollywood boulevard. 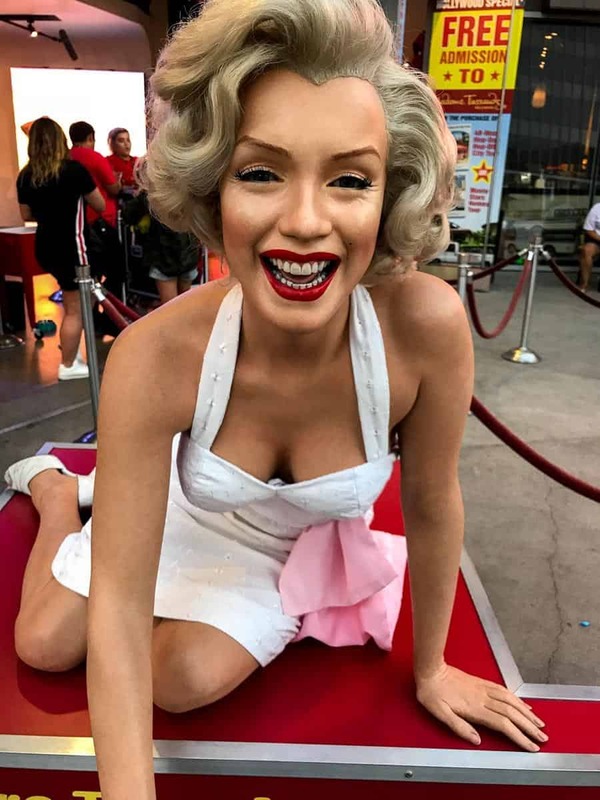 If you’re looking for fun things to do in LA that the whole family will love, check out Madam Tussauds and get your picture taken with your favourite celebrity. The kids will love walking around and taking selfies and marvelling at the meticulous, realistic work on display, meeting over 125 incredibly life-like figures from the celebrity worlds of film, television and more! At the door adult (13+) tickets are $39.95 USD and child (3-12) tickets are $23.95 USD, under 2 year olds are free. For discounted tickets, I recommend you book online through Klook to save heaps. At the time of publishing – adult tickets were $21.90 US and children tickets were $18 US. That’s a massive saving, almost half price! Click here to book your discounted tickets. The museum is open daily from 10 am-10 pm and is located next to the TCL Chinese Theatre on the Hollywood Walk of Fame. Looking for a new backpack for travel? Click here for my guide to the best backpack for lightweight packing. This one is for the Mums and Dads who are interest in some of the film and music history of Hollywood. Stroll down the Sunset Strip and see where some of Hollywoods greats wined and dined, performed, stayed, lived and in some cases died. The Sunset Strip is the section between Havenhurst Drive and Doheny Drive, it has been the place for many historic events, such as the counterculture protests in the 1960s and the Rock and Roll decadence in the ‘70s and ‘80s. More recently it has undergone a chic revival, with luxury hotel towers and fine restaurants. Number 8221 – Chateau Marmont: A castle-like luxury establishment that has housed its share of Hollywood gossip. This is where comedian John Belushi died from an heroin overdose. 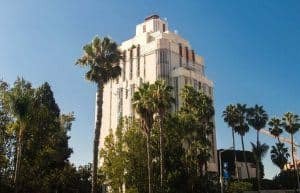 Number 8358 – Sunset Tower Hotel: This historic Art Deco hotel achieved landmark status from the moment it opened in 1929. This lavish hotel attracted famous residents such as Marilyn Monroe, John Wayne and Elizabeth Taylor to name but a few, with its advanced technology, décor and location. Sunset Tower Hotel has appeared in many famous films over the years giving the hotel its star status. A quick photo stop with this iconic landmark is a must for the holiday album. Number 8433 – The Comedy Store: Many famous comedians have been featured at this venue at one time or another. 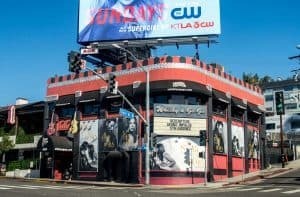 Number 8852 – The Viper Room: Once owned by Johnny Deep, you may recall this nightclub being most famous for the place where actor River Phoneix died in 1993 from a drug overdose. 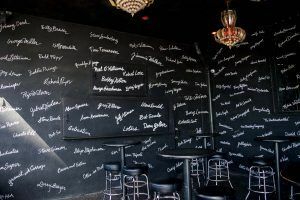 Number 8901 – Whisky A Go Go: A famous music venue where many bands got a start – bands such as The Doors, The Who, The Kinks, The Byrds, Led Zeppelin and Jimi Hendrix once played here. Number 9015 – Rainbow Bar: Back in the day this is where Marilyn Monroe went on her first date with Joe DiMaggio and where Vince Minnelli proposed to Judy Garland. One of the highlights of my recent trip to LA was definitely the Warner Brothers Studio Tour. On this guided tour you not only get to see where some of your favourite movies and TV shows were made but also learn all about just how they are made. I’m not a huge TV and film buff, but I was just enthralled learning all about all the behind the scenes stuff. And I must admit it was super cool to see where some of my favourite shows and movies were made such as ER, Annie, Friends, The Greatest Showman, Minority Report, the Cable Guy, Ellen and loads more. The tour involves a look at some of the backlots ( as featured above), as well as a look at inside some real life working sets. There are also a few stops where you can see some costumes, various bat mobiles, the prop shop as well as an excellent museum at the end. I spent around 90 minutes at the Museum. They say no tour is ever the same, I guess it depends on what is going on on the day of your visit. So you can come back again and again and you will see something different each time. The only sad part is, kids under 8 are not allowed, which is unfortunate as I would think many kids would absolutely love this tour. But if your kids are over 8, honestly this would be one of the best family things to do in Los Angeles. You will need to purchase tickets in advance. Tickets are $65 USD per adult (13+), $55 USD per child (8-12), and children under 8 not permitted. Click here to book via Klook. The guided component of the tour went for around 90 minutes and then as I mentioned I spent another 90 minutes exploring the Museum. Tours start at the Warner Bros studio which is located on 3400 West Riverside Drive, Burbank. Its a little out of town so I recommend driving or take an Uber. 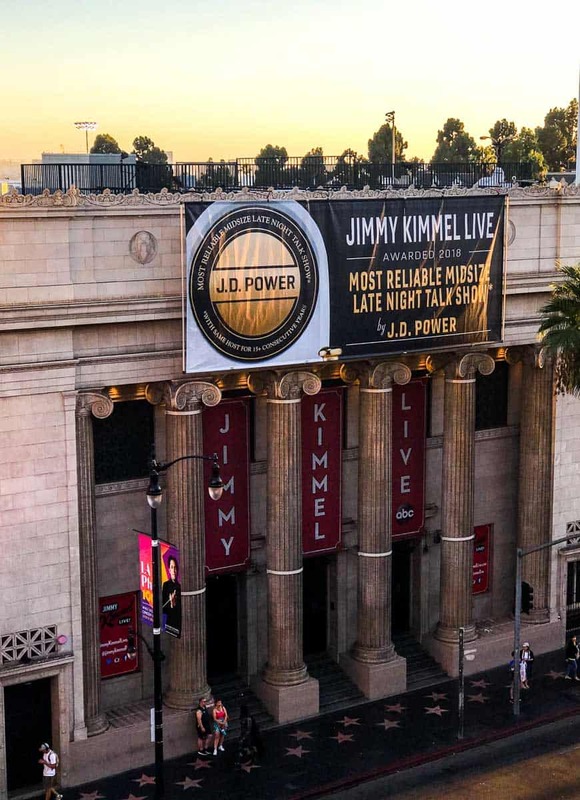 Attending a free TV show taping in LA, is a great opportunity to see your favourite television stars live and in person and is no doubt one of the best free things to do in LA. There are many online audience service companies that offer these free tickets. As tickets are usually released 30 days in advance with popular sitcoms and talk shows selling out the day they are released, I recommend planning this in advance before you commence your family holiday. Just double check the minimum age requirement before booking to ensure the whole family can attend. Audiences Unlimited represents a variety of shows to suit the whole family like “America’s Funniest Home Videos,” and sitcoms suited to adults and older kids like Last Man Standing, The Neighbourhood and more. On Camera Audiences specializes in providing audiences for talent shows like “Dancing with the Stars”, “America’s Got Talent”, and “So You Think You Can Dance” as well as game shows like “The Price is Right”, “Family Feud” and “Let’s Make a Deal”. You can also apply online for tickets to the Ellen Show or contact the studio no later than noon the day of the taping to see if you can get a standby ticket by calling (818) 954-5929. Easily one of the top 10 things to do in Los Angeles with kids, is a visit to Griffith Park. This park is over 4000 acres of natural landscape covered with California oak trees, among other diverse flora and fauna. Being the largest public park in the USA, it is not only a gorgeous setting for hiking and picnics, but it also has tons of LA attractions for kids. The park is open daily from 5.30 am -10:30 pm and the main entrance is at 4730 Crystal Springs Dr, Los Angeles. Here you can see space related exhibits and star shows in the planetarium. The Observatory also has great views of downtown LA and the Hollywood sign. Entry to the Observatory is free, but you must buy tickets to the planetarium show (only purchased at the observatory). Ticket Prices are $7 USD per adult (13+), $3 USD per child (5-12). If you are looking for things to do in LA with toddlers, under 5’s are admitted to the first show of the day only and must sit on an adults lap. Check out their website for programs and times of shows. Griffith Observatory is located at 2800 East Observatory Road. It is closed Mondays but open every other weekday from noon to 10 pm. On Saturday and Sunday, it is open 10 am-10 pm. This zoo stretches over 113 acres and is home to more than 1,100 birds, mammals, amphibians, and reptiles representing more than 250 different species including 29 endangered ones. This zoo is also well-known for its exciting special exhibits, events and evening programs that are ever changing throughout the seasons. General Admission is $21 USD per adult (13+) and $16 per child (2-12) with under 2’s being free. Carousel Tickets for all ages are $3 USD. The Zoo is open daily 10 a.m. – 5 p.m and located at 5333 Zoo drive (Across from the Autry Museum of Western Heritage). Travel Town Museum is a railway museum where kids can explore various travel-themed experiences, like the popular miniature train ride. They have regular events and workshops throughout the year like passenger car tours and engineer playdays. Check out their events calendar to find out more. With free entry and train rides only $2.75 US per person, you can’t go wrong. The travel town museum is open daily from 10 am-5 pm (closed Christmas day) and is located at the North west corner of Griffith Park. Sitting on 2 acres in Griffith Park, this playground features several fantastic play elements, and is designed to be accessible to kids of all abilities. This free and fun imaginative playground is located at 4800 Crystal Springs road which is mid park. If you’re looking for trendy La tourist spots, take a stroll down Melrose Avenue. Melrose Avenue is lined with fun boutiques and is one of the places to visit in Los Angeles if you love to shop. This shopping, dining and entertainment destination would be a hit with teenagers that love fashion. During a tour at Paramount studios you will get to explore and see the sets where many well-known movies and TV shows are made. You will get an insight into Hollywood history and insider knowledge by your tour guide. There are 3 tours to choose from depending on how much time and money you want to spend. The standard cart ‘Studio Tour’ is 2 hours long with several slots to choose from daily during the morning and afternoon. This tour will give you a behind the scenes look at a true working studio, getting to visit iconic locations whilst learning the history of Paramounts legacy. The cost of this tour per person is $58 US. The ‘VIP Tour’ is 4 and a half hours long and only available on weekdays. This tour includes everything in the standard tour plus VIP access to archived production facilities, food, 15% discount at the studio store, complimentary parking and a personalized photo to take away. This tour is $178 US per person. The ‘After Dark Tour’ as the name suggests is an evening tour that is on foot and not in a cart like the other two. It is 2 and a half hours long and only suited for years 16 and over due to the eerie nature that this tour explores such as exclusive access to the Hollywood forever cemetery whilst listening to dark stories that are said to haunt the Paramount studios at night. This tour operates Thursday, Friday and Saturday evenings only and is $78 per person. Tours are only suitable for children aged 10 and over. 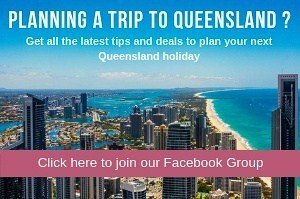 If you would like to book either of the above tours online, click here. Paramount studio is located at 5515 Melrose Ave, at the corner of Melrose Ave and Plymouth Blvd. Both the markets and the Grove are open daily and located at 6333 W 3rd St, Los Angeles. 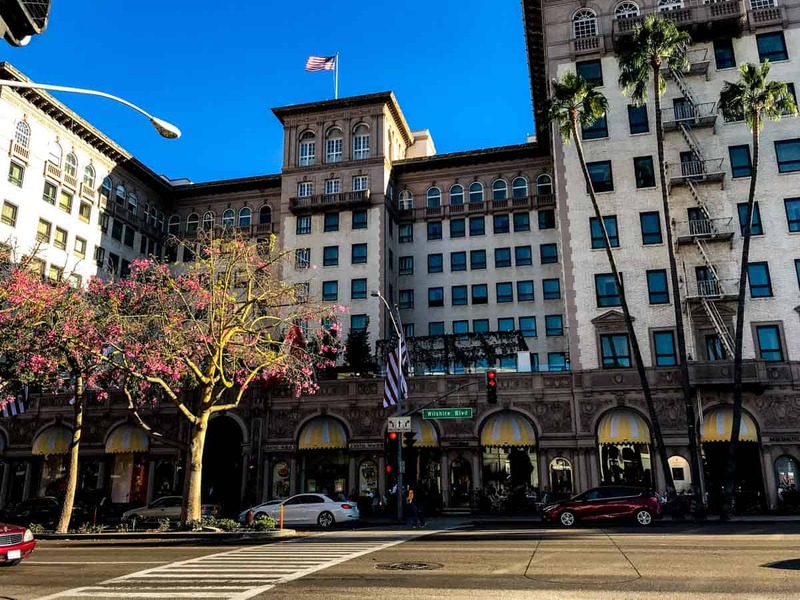 For all my Pretty Woman fans out there – where to go in Los Angeles for clothes? Rodeo Drive Baby. Well that would be window shopping if you have the same bank balance as I do. Famous for its fancy upscale boutiques and the expensive cars such as Lamborghini’s, Rolls Royce’s, and Bentley’s parked out the front, Rodeo drive tends to be one of the most see LA tourist spots, particularly for Pretty Woman fans. Don’t forget to check out the Regent Beverley Wilshore Hotel where both Julia Roberts and Richard Gere’s characters spend the week. Also if you are a trashy reality TV show fan (like me) of “Housewives of Beverley Hills” stop by Kyle by Alene on 9647 Brighton Way and Lisa Vanderpump’s restaurant Villa Blanca at 9601 Brighton Way. Brighton Way across over Rodeo Drive. 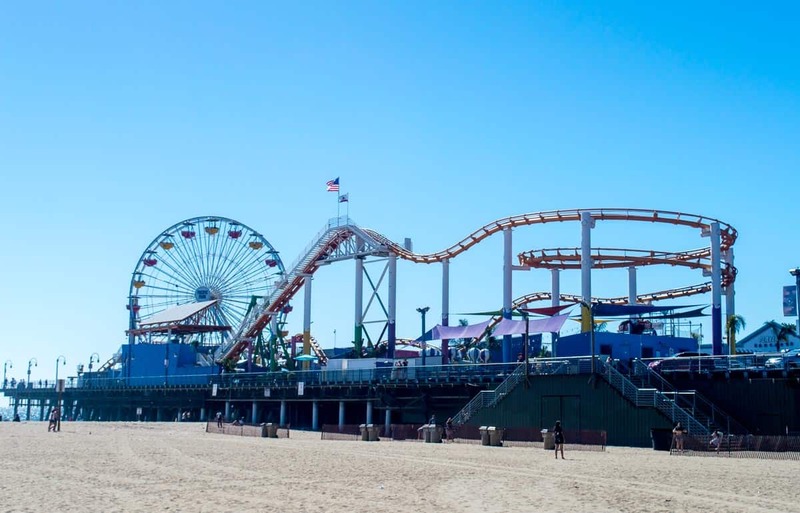 One of the best family things to do in LA would have to be a visit to Santa Monica Pier. This landmark is very popular with locals and tourists alike and home to Pacific Park amusement park. This iconic amusement park is not a big, extravagant theme park like LA’s more renowned attractions; but it has a carousel, ferris wheel, and a roller coaster, along with some tamer rides for the little ones. Whilst entry to Santa Monica Pier and Pacific fair is free, rides and attractions are priced individually and start at $5 USD. You can purchase also purchase unlimited ride passes starting at $17.95 USD. For discounted tickets and to avoid wasting time queuing up at the ticket booth, purchase online from Klook. 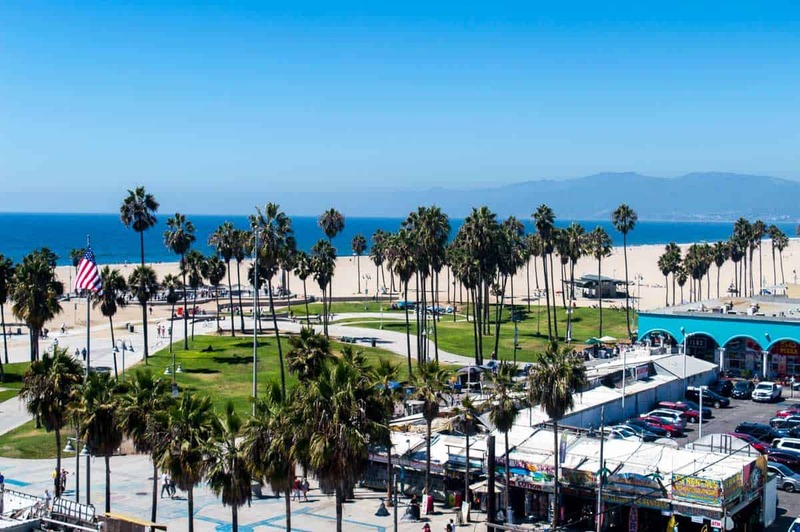 For more family fun in Los Angeles head down to Venice Beach. This quirky funky beach, along with its iconic beachfront boardwalk, hosts street entertainers and vendors that the entire family will love. Remember if you take a snap of a street performer it is polite to tip them, make sure to have some change on you. I recommend you start your visit at one of the roof top restaurants / bars for this fantastic view! Yes they are a little more expensive then one of the street cafes, but you can just purchase a drink if you want to save. Then take a stroll from here along the board walk all the way up to Santa Monica beach, stopping at the various stalls or watching the buskers along the way. Without stopping the walk will take around 30 minutes. 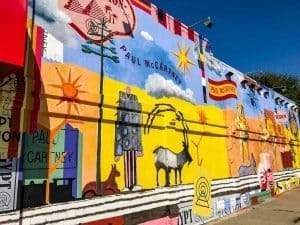 You also might like to take a detour inland to see the Venice canals and street art. 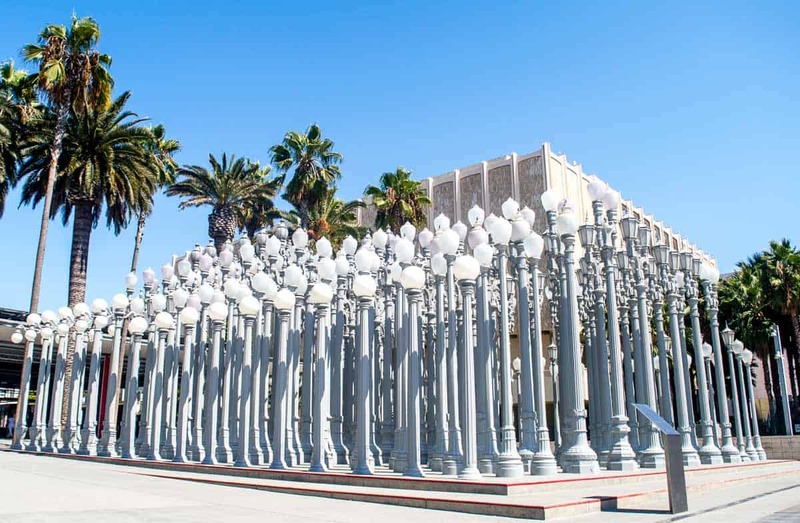 If your family is a lover of art, then places to go in Los Angeles include a visit to the LA County Museum of Art. Here you will find a huge volume and diversity of art with collections ranging from pre-history to contemporary art. With continuously changing exhibitions stretched across more than 20 acres of land, I would recommend checking out the museums event calendar before you go. Admission is $15 USD for adults, children 17 and younger are free. Even if you don’t have time to go inside and explore the museum, come check out the Urban Light display out the front. Kids will love running through the different size lamp posts and the display makes for some photographs. The museum is located at 5905 Wilshire Boulevard, and I recommend you click here for opening hours as they do tend to vary. The Grammy Museum is one of the great kids museum Los Angeles has on offer for families. 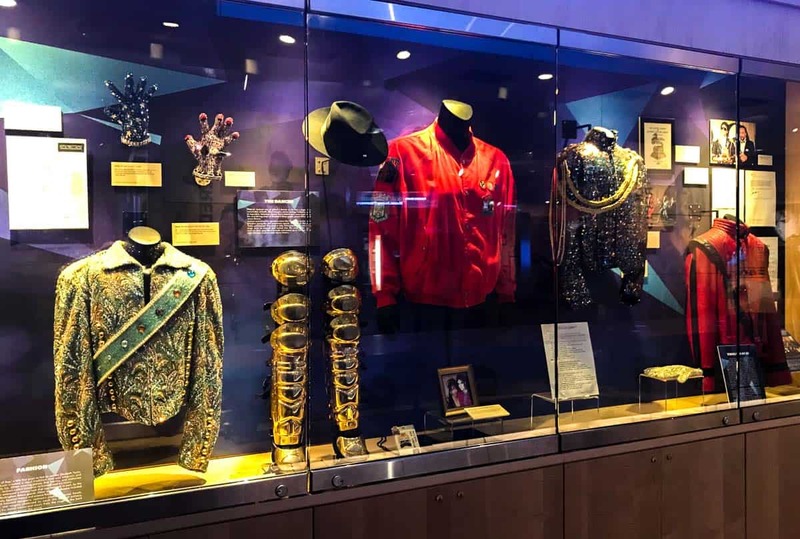 Here you can explore the history and cultural significance of American music and see some amazing artifacts from music history such as precious manuscripts, costumes, ornaments, and commemorative short films, at this iconic museum. And if you are a Michael Jackson fan like me, you’ll live the display of some of this most iconic costumes. There is plenty of interactive exhibits for the kids, including play a range of musical instruments and recording your own music. For Mum and Dad there is a huge range of music exhibits rock and hip-hop to country, classical, Latin, R&B, and jazz. I really enjoyed the Grammy Museum and spent around 90 minutes here. However I was on my own, I think for a family you could spend 2 hours or more, particularly if you had a go at the various interactive exhibits. Adult tickets are $15 US and child (6-17) tickets are $10.95, children 5 and under are free. For discounted tickets I recommend you buy online from Klook as you can save a stack! At the time of publishing, adult tickets were $11.90 US, whilst kid’s tickets were $7.90 US. Bargain! Click here to book your discounted tickets. The Grammy Museum is in downtown LA at 800 W. Olympic Blvd, (on the corner on W. Olympic Blvd. and Figueroa St). For trading hours and further directions click here. 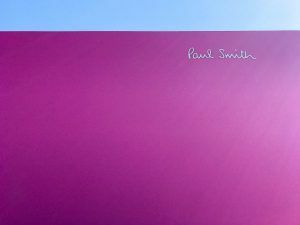 If you’re kids love bright big objects they will love the Broad Art Museum. Myself I’m not a huge art lover, but I really enjoyed the various pieces on display here. The Yayoi Kusama’s Infinity Mirrored room: here you experience a beautiful, multi-coloured light display which seems to go on forever (you must reserve a free timed ticket in person once you’re inside the museum). 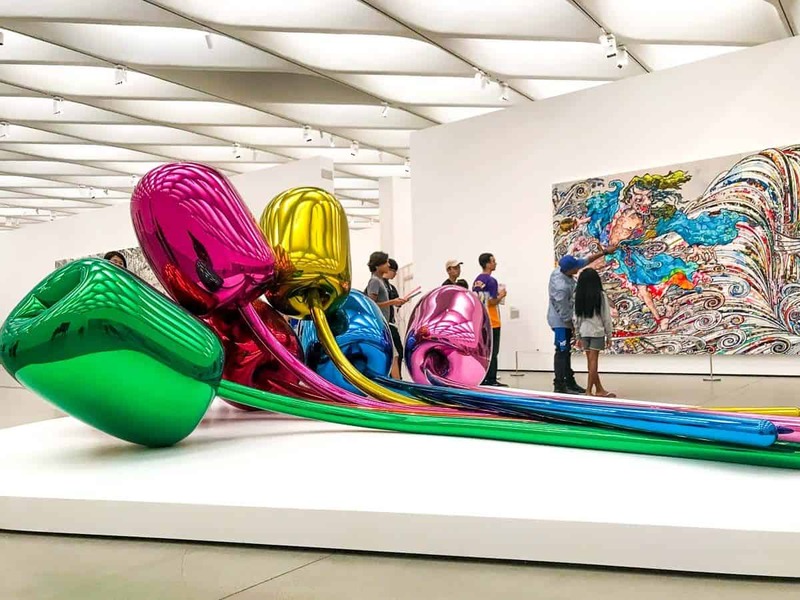 Jeff Koons sculptures: Picture above, these large, delightful stainless steel sculptures will amuse the whole family. Under the Table: Kids and adults alike will love feeling extra small among the gigantic furniture. The Broad’s free mobile app, enhances your experience by providing information about the Broad and its collection. The museum is situated on Grand Avenue in Downtown Los Angeles at 221 S Grand Ave and admission is free. However you still must reserve a ticket online or que up in the standby line outside the museum which operates on a first come first serve basis. The Broads opening hours vary so click here for accurate times. Please note only single strollers are permitted inside the museum, if you have a jogging or double stroller I recommend wearing a baby carrier if possible or holding your baby / infant. Even if you don’t go to see a show at the Walt Disney Concert Hall I highly recommend you stop by to check out this magnificent building! Its only a short walk from the Broad – and you won’t miss it! The Hall’s exterior is an architectural masterpiece and you will be in awe of the metallic curves of the building. 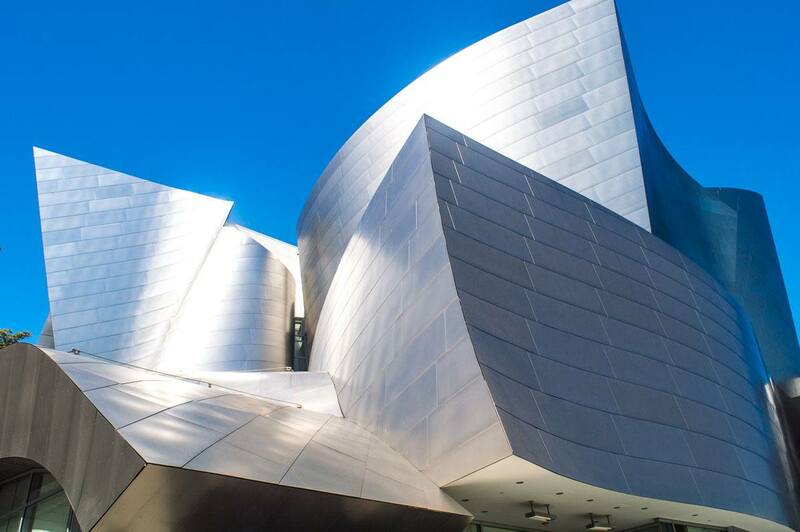 The Disney Concert hall is located at 111 South Grand Avenue in downtown Los Angeles. This museum is the largest natural and historical museum in the western United States, home to over 35 million specimens that go back billions of years. In the Dinosaur exhibit the kids will love seeing fascinating pre-historic creatures and checking out the T. Rex Growth Series inside the Dino lab where they can see paleontologist work behind the scenes. General admission adult tickets are $15.00 USD, youth (13-17) tickets are $12 USD and child (3-12) tickets are $7 USD, children 2 and under are free. For discounted tickets I recommend you buy online from Klook to save! At the time of publishing, adult tickets were $12 USD, whilst youth tickets were $11.80 USD and child tickets were $6 USD. Click here to book your discounted tickets. The museum is open daily from 9:30 am – 5 pm but closed on public holidays. The Natural History Museum of Los Angeles County is at 900 Exposition Blvd. in Exposition Park, between Vermont Avenue and Figueroa Street. Of course there are some world famous theme parks in and around Los Angeles which is often the main reason for a family holiday here. Below I have listed some of the places to go for the best kids activities Los Angeles has for families. As well as where to get discounted tickets. Fun activities in Los Angeles don’t get much better than this! There’s not much I can that you don’t already know about the most famous theme park in the world. Full of the traditional Disney charm and attention to detail, your visit here will create memories to last a lifetime especially with the help of the obsessively perfect Disney cast and staff who make sure your visit runs smoothly. Disneyland is about experiencing the fairy-tale and watching the famous cartoon characters of Walt Disney come to life. The child in you will enjoy this place as much as your children. Disneyland is more about family fun than motion sickness fast rides, however, a section of the park – Tomorrowland has a few rides for the thrill seekers. Also in Disney California Adventure Park you will enjoy 7 exciting lands that bring Disney, Pixar and superhero stories to life. You’ll have the chance to meet all your favourite Disney characters at both parks, in addition to rides, experiences, and attractions from Marvel, Star Wars, Pixar Animation, and more! Just a word warning – this place is HUGE!!!! I went some years ago with a day 3 pass and was exhausted! There are plenty of posts on the internet about how to tackle a visit to Disneyland so I won’t go into it here, only to say if you want to do more than touch the surface here, I’d recommend at least 2 -3 days here. I mean some families even stay a week! Tickets come in a variety of configurations. Which type of ticket is right for you will depend on the season, how much time you have; how much you want to spend and how much flexibility you need. For discounted tickets I recommend you buy online from Klook as you can save a stack! At the time of publishing, for a 1 day regular season admission ticket to either Disneyland Park or Disney California Adventure Park, adult tickets were $93 USD, whilst child (3-9) tickets were $87 USD. Or a ‘Hoppa’ 1 day ticket allowing you to visit both parks on the same day were $160 USD for adults and $153 USD for kids. Click here to book your 1 day discounted tickets. Alternatively, if you have more than one day you can buy a 2 day ‘1 park per day’ ticket which allows you to visit either Disneyland Park or Disney California Adventure Park each day. At the time of publishing these tickets were $201 USD per adult and $190 USD per child. There are also 2 Day Park Hopper Tickets, 3 Day ‘1 Park Per Day’ Tickets, and 3 Day Park Hopper Tickets available. Click here to see how much you can save. Disneyland is open every day of the year. With opening hours being seasonal check their website for more accurate times when you visit. Disneyland is located in Anaheim at 1313 Disneyland Drive, you can get here by car, bus or train- click here for more information and directions.Better get stay in Anaheim near the park for the few days you intend to explore Disneyland. 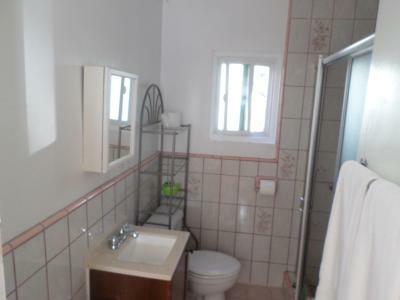 Click here for family accommodation near Disneyland. Another one of the great things to do with family in Los Angeles is a day trip to Universal Studios. 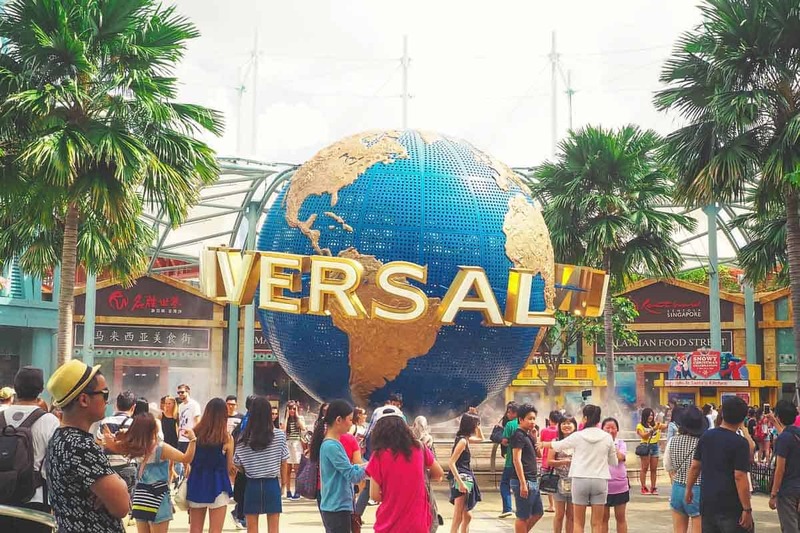 There are many movie rides here to give you an adrenaline rush, from Revenge of the Mummy, to Jurassic park and Transformers to name but a few. From cartoon characters to studio tours there is also other things to see and do if the fast-paced thrill-seeking rides don’t appeal to you. I’ve visited Universal Studios multiple times over the years and love it! Its a great day for the entire family and has a range of rides and shows suitable for the entire family. I personally think 1 day at the park is plenty. Tickets come in a variety of configurations in low season and high season to regular 1 day or 2 day tickets in addition to Universal and VIP tickets. Universal tickets allow one-time express access to each ride, attraction and show (excluding retail locations and restaurants). Whereas VIP tickets allow unlimited front of line access to each attraction and priority seating at each show, also included in this ticket is a guide, lunch and access to exclusive lounge. Which type of ticket is right for you will depend on how much time you have; how much you want to spend and how much flexibility you need. High season regular 1 day adult tickets are $114 USD and Children tickets are $108 USD. For discounted tickets I recommend you buy online from Klook as you can save heaps! At the time of publishing, high season regular 1 day adult tickets were only $101 USD and Children tickets were only $96 USD. That’s a saving of over $10 per ticket! Click here to buy discounted tickets online or to see how much more you can save with other ticket options. Open every day of the year. With seasonal opening hours, check their website for accurate times when you visit. Universal Studios is located at 100 Universal City Plaza, Universal City which is located just north of downtown Los Angeles in the San Fernando Valley. In addition to the well-known Disneyland and Universal Studios Hollywood, you have the family-friendly Knott’s Berry Farm. This Snoopy inspired theme park has a nice mixture of rides for younger kids, and high thrill roller-coasters and other fast exhilarating rides to keep the big kids entertained. The original Ghost Town hosts various live interactions with colourful historic characters, which is expanded in summer. 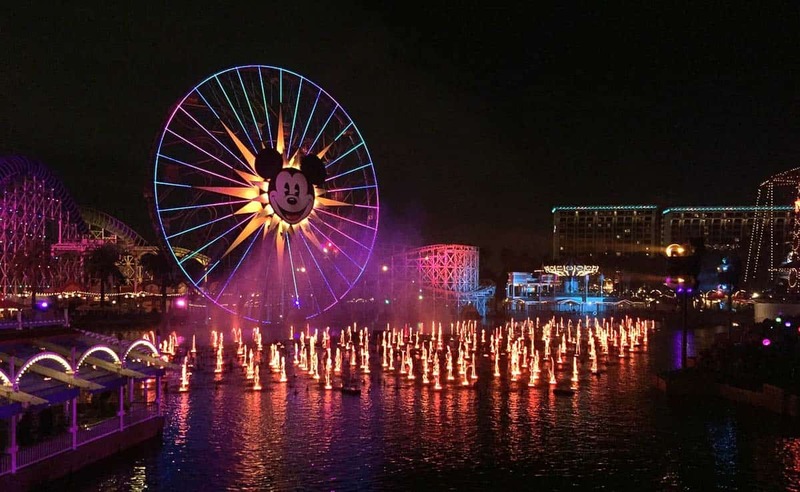 With whats on offer and things to do here I believe it offers the best value among all the theme parks in LA, especially if you get discount tickets online. Prices vary depending on the day purchased- they will be approximately around $50.00 online and $82.00 at the gate, click here to buy online and see different ticket types. Check out the website for seasonal operating hours. Knotts berry farm is at 8039 Beach Blvd, Buena Park, which is near Anaheim. This seasonal waterpark is LA’s largest water park boasting a total of 22 speed, tube and body slides plus a giant wave pool, lazy river and interactive kid’s area. You can hire cabanas for the day also to have some time out and there are also a few dining options on sight. You will love spending a family day out here- weather permitting of course. Various ticket combinations, prices range from $40 USD for a general day admission ticket. You can also buy a combined ride n slide ticket for entry to Knotts Soak city and Knotts Berry Farm on the same day for $75 USD, click here for more information and to get your tickets online. Park hours are seasonal check out their website for exact hours for when you plan to visit. Knotts Soak City is next to Knott’s Berry Farm. Six Flags Magic Mountain is a 262-acre amusement park in Valencia that is more suited for courageous teens who love extremely fast rides. Due to the amount of thrill rides here it is LA’s most extreme amusement park and its no wonder why fans of fast scary rides flock here. General Admission is $84.99 USD, tickets for children under 48” in height are $59.99 USD and children 2 and under are free. For discounted tickets I recommend you buy online from Klook as you can save heaps! At the time of publishing, adult tickets were only $56 US and Children tickets were only $53 US. WOW!!!! that’s a huge saving of nearly $30 per adult ticket and $7 per child! Click here to buy discounted tickets online. Six flags magic mountain is open daily, but times are seasonal check out the website for exact times. Located at 26101 Magic Mountain Parkway, in Santa Clarita. Have a family day out visiting this famous wildlife park and its massive array of marine animals including seals, sea lions, polar bears, whales, penguins, bottlenose dolphins and more. 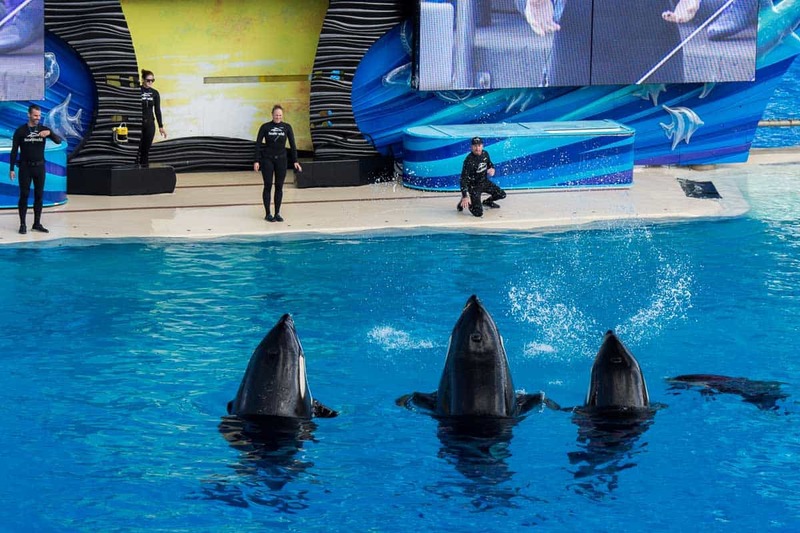 Sea World is all about the animals and offers many live shows such as Turtle reef and the Shark encounter. And to change it up a bit or in between show times hop on the theme park rides and experience thrilling attractions such as the double-launch roller coaster Manta. There are various ticket options to choose from depending on how many days you have and how much you want to spend on your experience. 1 day on the gate general admission tickets (3+) cost $89.99 USD and single-day ticket with all day free dining cost $125.98 USD. For discounted tickets I recommend you buy online from Klook as you can save a stack! At the time of publishing, 1 day general admission tickets were $71.57 USD and single-day tickets with all day free dining were only $90.10 USD. That’s a huge saving! Click here to buy discounted tickets online. Park hours and show schedules are updated periodically. Check out their calendar on SeaWorld’s official website for accurate information. Located in Mission Bay Park, 500 Sea World Dr, San Diego. Sea World San Diego is two hours south of Los Angeles via vehicle. 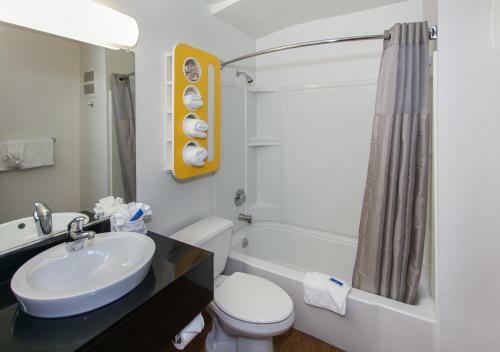 It is also accessible by public transportation from LA, click here for more assistance. I haven’t been myself, but I have heard from other that this is fantastic if you are looking for fun things to do with kids in Los Angeles. Marvel at everything constructed from LEGO bricks. Highlights include feeling like giant’s when walking through Miniland USA with miniature recreations of Washington D.C., New York, and San Francisco and more in addition to checking out the recreated scenes from the Star Wars movies. The park has more than 60 rides, shows, and attractions that both kids and adults will enjoy, from rollercoasters, live shows, and even meet-and-greets! There are various ticket options to choose from. For a on the gate 1 day general admission ticket its $109 USD for adults (13+) and a $103 USD for children (3+). For discounted tickets I recommend you buy online from Klook as you can save heaps! 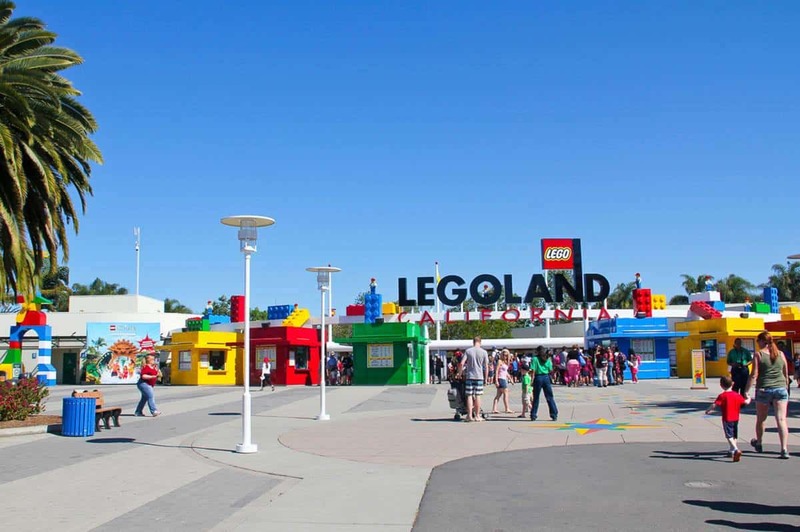 At the time of publishing, 1-Day Admission to Legoland California + SEA LIFE Aquarium were only $79 USD! That’s a huge saving of over $20 per ticket! Plus, you also get you into the Sea life Aquarium as a bonus!!! Click here to buy discounted tickets online. Legoland Hours are normally daily between 10:00 am to 5:00 pm but park hours are updated periodically, and some days in certain seasons are closed. Click here to view the calendar. Legoland is located at One Legoland Drive, Carlsbad, which is in between Anaheim and San Diego. The aquarium has over 11,000 animal exhibits, and numerous opportunities for up-close encounters with marine life from all over the world including penguins, sharks and more! This is an interactive aquarium and kids will love dipping their hands in the tidal pools filled with marine life such as star fish, small sharks, sea cucumbers and more. From watching penguins waddling on land and swimming underwater, peering through the floor to ceiling windows at the vast underwater ecosystem, going on Harbor Tours, watching a 4D film, and participating in a variety of children’s educational programs- there’s so much to see and do that will entertain the entire family. Adult (12+) tickets are $29.95 USD and child (3+) tickets are $17.95 USD. For discounted tickets I recommend you buy online from Klook to save. At the time of publishing, adult (12+) tickets were $27.60 US and child (3+) tickets were $16.30 US. Click here to buy discounted tickets online. The aquarium is open every day from 9 am to 6 pm except for Christmas day and is located on Long Beach, at 100 Aquarium Way. From downtown LA you can catch the Metro blue line straight to the Aquarium. Experience an American adventure and walk the passageways and compartments where 3,000 sailors fought America’s wars on this self-guided tour. I recommend you download the interactive tour app of the USS Iowa whilst on this journey; via the app you’ll watch videos about the war, hear crew member stories, fun facts, ship service records, and view videos of the USS Iowa in action, whilst exploring this large vessel. Click here to download the app. Adult tickets are $19.95 USD and child (6-11) tickets are $11.95 USD, children 5 and under are free. For discounted tickets I recommend you buy online from Klook as you can save a stack! At the time of publishing, adult tickets were $16.90 USD, whilst kid’s tickets were $9.90 USD! Click here to book your discounted tickets. The USS Iowa Museum is a maritime museum is open daily from 10 am- 5 pm and is located at the Port of Los Angeles in San Pedro. 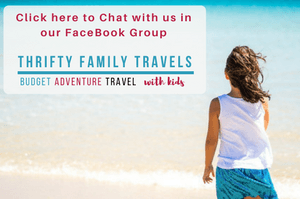 If you prefer someone else to take care of transport, here are some of the more popular group tours your family can join. With so much to see and do in LA you might want to opt for this organised 6 hour tour of the city with a professional tour guide who will fill you in on the amusing history and diverse culture of the ‘City of Angels’. Discover the iconic landmarks, famous neighbourhoods, architectural wonders, and film locations within Hollywood, Beverly Hills, the Sunset Strip, the Santa Monica and Venice Beaches and more! For lunch enjoy a delicious meal at the Farmers Market & The Grove or The Original Farmers Market. This tour is perfect for families who want to fit all the iconic and famous sights in to half a day whilst in LA! The tour price includes a Los Angeles map, bottled water and tour transportation (air-conditioned mini bus). You can choose a tour starting at 9 am or one starting at noon. Tour prices are Adults at $84 USD and Children at (3-11) at $60 USD. For discounted tickets I recommend you buy online from Klook to save. At the time of publishing, adult tickets were $71 USD and child tickets were $50.93 USD. That’s a saving of over $10 on adults’ tickets and nearly $10 on child tickets!!! Click here to buy discounted tickets online. This tour returns and departs at the LA City Tour Meeting point on Hollywood boulevard. Click here to view map. On this tour you can see the homes of all your favourite Hollywood celebrities. 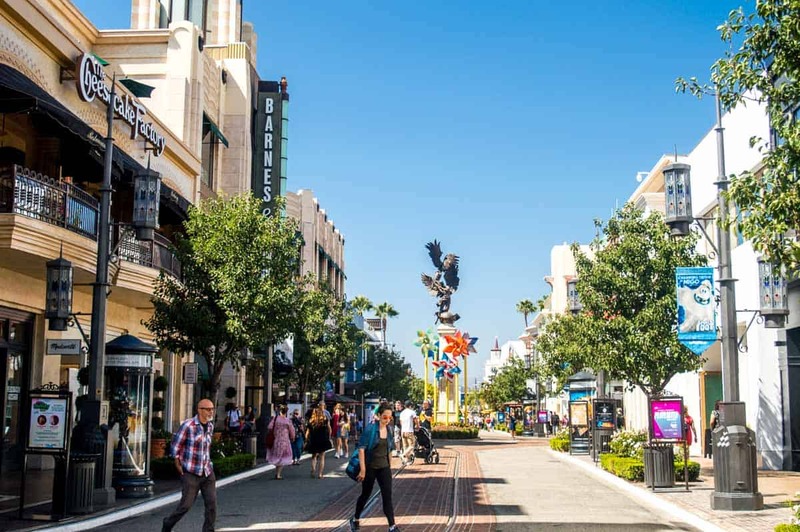 This 2 hour bus tour takes you down the iconic Rodeo Drive, Bel Air, and Sunset Strip where celebrities frequently visit to shop and eat. Drive by the mansions, and homes of celebs past and present whilst hearing facts, and insider gossip from your professional tour guide. Take selfies and family photos with the iconic Beverly Hills and Hollywood signs. 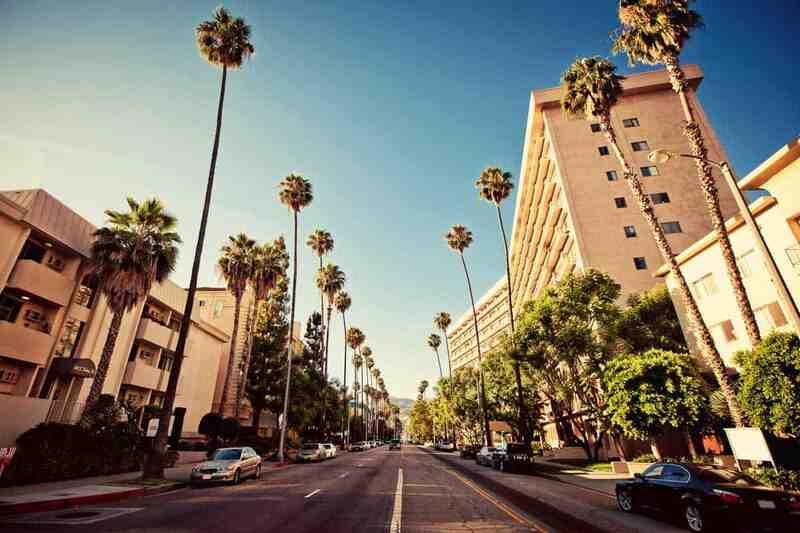 Drive by the major Hollywood attractions and see some historic studios and film locations. Choose from either an open top bus or an air-conditioned mini bus to cruise around in. Prices range from $49 USD for adults and $39 USD for children (2-12). For discounted tickets I recommend you buy online from Klook to save. At the time of publishing, adult tickets were $44 US and child tickets were $35 US. Click here to buy these discounted tickets online. The departure and return point for this tour is at the LA City Tours office on the Hollywood Walk of Fame, click here to see map and directions. Free hotel pick-up is available from hotels in Hollywood, West Hollywood and North Hollywood. Tour hours do not include hotel pick-up and drop off time. This 3 hour and 15 minute tour provides an in depth experience of Hollywood by learning about decades of Hollywood history, visiting current and past celeb homes, visiting iconic landmarks and visiting movie locations. 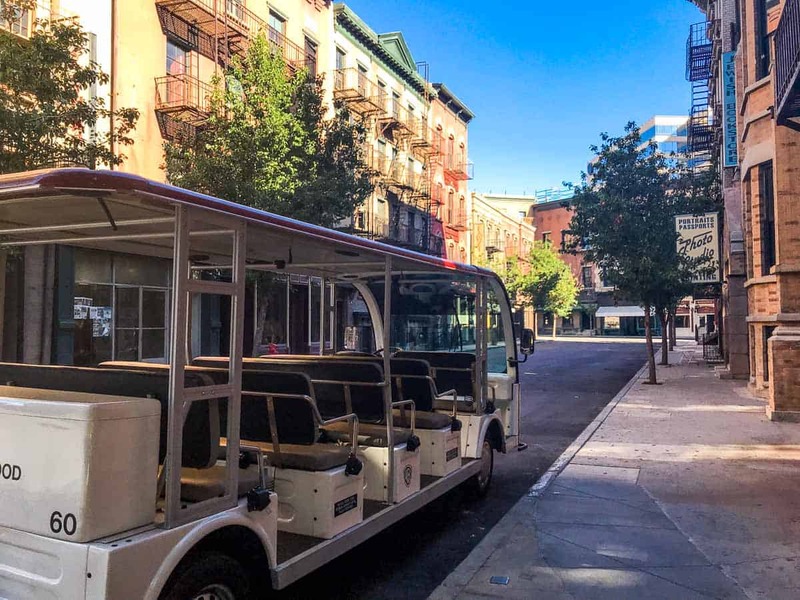 This tour is a combination of the Hollywood Behind-the-Scenes tour which is 75 minutes and the Movie Stars Homes Tour which is 2 hours long and is perfect for a family that want to gain a deeper understanding of the movie industry and want to feel as close as possible to Hollywood celebrities. Adult tickets are $72 USD and child tickets are $52 USD. For discounted tickets I recommend you buy online from Klook as you can save heaps! At the time of publishing, adult tickets were $64.75 USD, and child tickets were $46.77 USD that’s a huge saving! Click here to buy discounted tickets online. 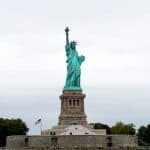 It’s most likely that you will be visiting many of the best attractions in Los Angels during your trip and so the below cards might help you save money as these cards combine multiple attractions. Be sure to do your own maths though! With the GO Los Angels Card you can choose from between 1- to 7-Day cards and pick from over 30 attractions to visit such as, Universal Studios Hollywood, Six Flags, Knott’s Berry Farm, and many more! This card also gives you discounts on other activities, shops, or dining experiences for 14 days starting from card activation date. 1 day cards are $89 USD for adults and $69 USD for children (3-12), prices then incline per day. 3 day passes are $219 for adults and $189 for children, and 7 day passes are $339 for adults and $299 for children. Prices appear expensive but the cards can help you save a stack as opposed to purchasing individual attraction tickets. For example, over 3 days if you go to: Six Flags Magic Mountain (Adult general admission $84.99), Legoland (Adult general admission $109) and Knots Soak city and Berry farm ( Adult combined general admission $75.00) that’s a total of $268.99 US. Whereas the Go Los Angeles Card for a 3 day adult pass to visit all of the above attractions is $219 US- saving you $49.99- just under $50 bucks! To save you even more money I recommend you buy the Go Los Angeles Card online from Klook! At the time of publishing, 3 day passes were $196 USD for adults and $170 USD for children, and 7 day passes were $304 USD for adults and $269 USD for children. That’s a huge saving of between $20-$30+ bucks each pass! Click here to buy discounted passes online. Obviously, the saving would differ depending on what you wanted to go to over how many days, but I would recommend working out your options as I guarantee this card will save you money. If you like the sound of going on a tour bus listening to the interesting facts from a tour guide whilst seeing the Hollywood sights- but don’t want to navigate your way around the LA public transport system – then this LA & Hollywood City Sightseeing Bus Pass may be perfect for you. Hop on and hop off open top deck tour buses every 30 to 60 minutes depending on the 6 predetermined tour routes. 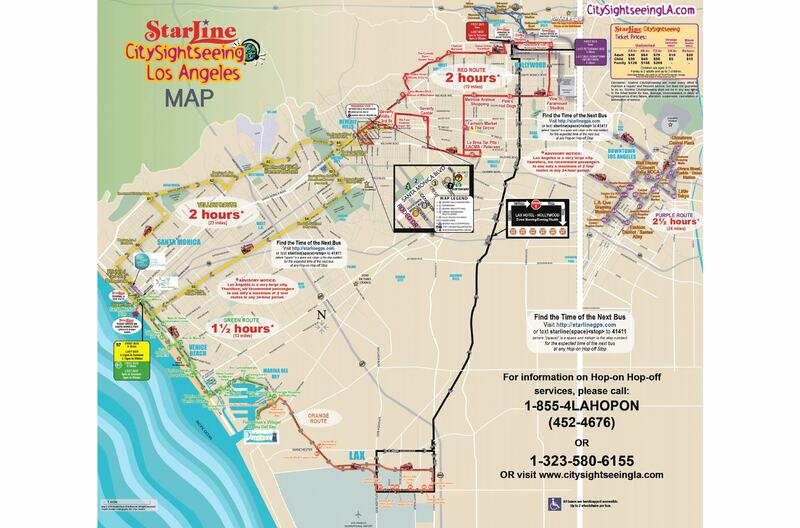 Routes are the Red Route (Hollywood & Beverly Hills), Yellow Route (Beverly Hills & Santa Monica), Purple Route (Downtown Los Angeles), Green Route (Venice & Marina Del Rey), Blue Route (Universal & Hollywood) and Orange Route (LAX Hotels & Marina Del Rey). Click on the map for complete routes and information. You can choose 3 configurations of passes from 24-hour, 48 hour or 72 hour. 24 hour passes for adults are $49 and $30 for children (3-11). 48 hour passes are A $64/ C $40 and 72 hour passes are A $79 & C $50- all prices in USD. Children 2 and under are free. For discounted tickets I recommend you buy online from Klook to save even more. At the time of publishing, 24 hour passes for adults are $41 and $25 for children (3-11). 48 hour passes are A $54/ C $34 and 72 hour passes are A $67 & C $42- all prices in USD. That a saving of between $5-12 on tickets!!! Click here to buy discounted tickets online. Los Angeles is really spread out and there is no one central location to stay. I’d recommend that if you are planning on visiting Disneyland for a few days as well as see some of the attractions around the centre of LA that you in fact split your time in two different locations. Stay a few days close to Disneyland and a few days in LA. I’d consider you look at areas like Santa Monica or for more budget options Hollywood. I’ve recommended a family friendly hotel for each area below, however if you want check out all the options click the relevant link: Anaheim, Santa Monica or Hollywood. A family room contains 2 double beds, sitting area, fridge, microwave and TV. Breakfast is also included in the rate. On site is a swimming pool, and restaurant serving breakfast. Directly across the road from Disneyland and surrounded by several places to eat. No need to wait for shuttle buses and can return during the day for a rest if need be. 70% of people on TripAdvisor rate this hotel as above average. At the time of publishing the rate was $201 for 2 adults and 2 children on Booking.com. Click here for more information about the Del Sol Inn or to make a booking. A family room contains 2 double beds, fridge, dresser and TV. A short walk to Venice Beach and Santa Monica Pier. 59% of people on TripAdvisor rate this hotel as above average. At the time of publishing the rate was $220 for 2 adults and 2 children on Booking.com. 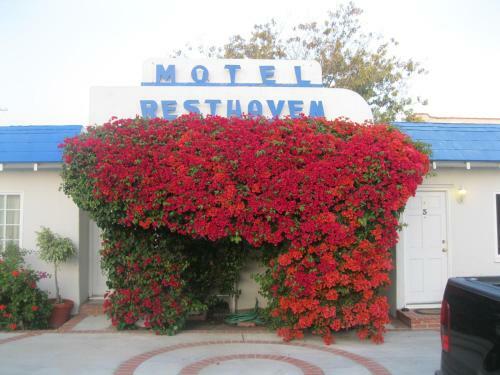 Click here for more information about the Rest Haven Motel or to make a booking. A family room contains 2 double beds, siting area and TV. 5 minute walk from all the major Hollywood tourist attractions and the Hollywood / Highland underground station. 44% of people on TripAdvisor rate this hotel as above average. At the time of publishing the rate was $163 for 2 adults and 2 children on Booking.com. 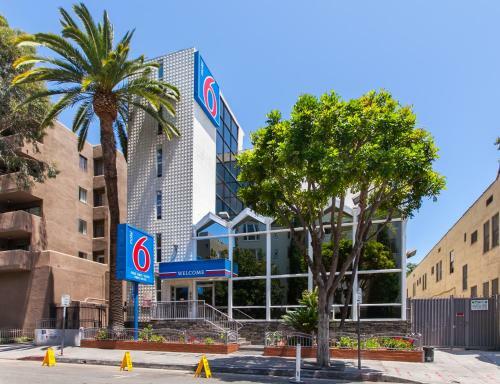 Click here for more information about the Motel 6 Hollywood or to make a booking. There are a couple of options to get from LAX to your accommodation – rental car, taxi/uber, shuttle or public transport. If you are hiring a car whilst your in Los Angeles, I’d recommend you pick it up here and make your way to your accommodation. If not read on. For families or 4 or more people, your best option is going to be taking an Uber or Lyft. It will cost around $35-45 to Hollywood and $40 to $70 to Disnyeland. Use the Lyft Fare Estimator or Uber Fare Estimator to calculate your fare for where you need to go. For families of less than 4 people headed into Hollywood, the FlyAway Shuttle is a great option. This service operates daily and stops at every LAX terminal. Getting to Hollywood is easy with the shuttle stopping at the west side of Vine Street in Hollywood half a block South of Hollywood Blvd. A one-way journey is $8 US, and two children 5 and under with each paying adult being free. Click here for a timetable and more information on fares. For Disneyland there are a few different shuttle options including Supershuttle.com, Primetimeshuttle.com or Shuttle2LAX.com. Fares start as low as $15 per person in a 9 passenger van from LAX, and they will pick you up or drop you off right at your Disneyland hotel. Catch train heading to Norwalk and change at Blue line Imperial / Wilimington. If your headed to Disneyland, at Norwalk Station take the Metro Bus 460 to Disneyland. To catch the metro you will need to purchase a tap card from the machine for $1. Add value to your card. Each ride is $1.75 USD (which includes 2 hours worth of transfers) or for $7 you can make unlimited trips all day. LA is not the easiest area to get around without a car as the public transport system is not that great. When I was in LA recently I found the easiest way to get around was via Uber or Lyft. Use the Lyft Fare Estimator or Uber Fare Estimator to learn more about the fare from your pick up to drop off point. Whilst not the best public transport system, you can get around large parts of Los Angeles by using the metro. Use Metro’s Nextrip service which makes planning your trips using public transport in LA much easier. See tips above about purchasing a tap card to use on the Metro. Thank you to the Warner Bros Studio Tour for hosting me. Of course all opinions expressed are my own and have not been influenced in anyway. Get our LA with Kids Guide FREE! Get our free 31 page guide which includes everything you need to know for a stress free trip to LA with the kids. 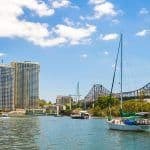 It includes the best attractions (including where to get discount tickets), best budget family hotels & how best to get around. Start planning that LA trip now!